Kolkata: It is a humid day and the temperature is in the mid-30s, but Bijoy Roy’s den in a rooftop apartment on Rowland Row is surprisingly cool and comfortable. “I lined the roof with upturned flowerpots and then laid another layer of concrete on it," says the 52-year-old architect, who shudders at the very mention of air conditioning. “The hollow layer helps insulate the rooms from the rays of the sun," explains Roy, who?graduated?from the School of Planning and Architecture (SPA) in New Delhi in 1977. The association with Baker strengthened during Roy’s first job, with a firm called Grup (Group for Urban and Rural Planning), formed by the legendary architect, Romi Khosla. A Cambridge graduate, Khosla has designed a number of institutional complexes as well as small community-based rural projects. His recent work includes development and revitalization projects for the United Nations Development Programme in Central Asia, Tibet, Egypt, and for the government of India?in?the Himalayas. “Laurie would often come down and share his ideas with us," says Roy. “What you see in my house is just one of the many elements that he propounded—the hollow roof." However, it is in some of the houses that Roy has built in and around Shantiniketan that he has pulled out all the stops incorporating the work of his greatest influencer, Baker, who died early this year. Rat-trap bonds, brick screens (jaalis), sloping roofs with indigenous tiles and skylights are some of the major elements that Roy, a visiting faculty at the Bengal Engineering and Science University, has used in these houses. “The rat-trap bond is a form of brick laying introduced in India by Laurie," says Roy. In this, two bricks are laid parallel to each other length-wise with a gap in between. Two bricks are laid width-wise at either end to seal the gap. This is followed by two more bricks laid parallel length-wise. This sequence continues till the entire wall is built. “If a rat enters the hollow when the wall is being erected, it can never come out, and hence the name,"says Roy. According to Roy, the cost of construction of the wall is reduced by one-fourth compared with the conventional English bond. “Each cubic metre of a conventional wall requires 350 bricks, whereas a wall built with rat-trap bond needs only 280," he says. Fewer bricks mean fewer joints. This, in turn, means less cement for the mortar. “The exterior looks good anyway and need not be plastered, and this saves money, too," says Roy. “The hollow within the wall acts as a natural air conditioner," says K.B. 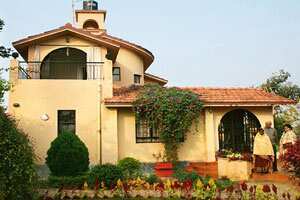 Sen who, along with wife Gopa, is the proud owner of Notun Alo (New Light), a house designed by Roy, in which he has used Baker’s principles extensively. “In summer, the temperature inside the house is usually at least 2-3 degrees lower than outside, and vice versa in winter," says the retired merchant navy officer, whose dream home is located in Prantik on the outskirts of Shantiniketan in Birbhum district, known for its extreme temperatures. The use of two layers of local burnt tiles with a hollow layer in between to create a sloping roof also helps moderate the temperature in the Sens’ house. Another Baker element introduced by Roy in Notun Alo is the use of brick screens. “The screen lets in the breeze and while the inmates of the house can see what’s happening outside, they are shielded from prying eyes by the angle at which the bricks have been laid," says Roy. The rooms also have huge ceiling-to-floor bay windows. “Not only do they allow the breeze to come in, they also afford 360 degree visibility, quite like a ship," says Sen.
To plug the paucity of water, endemic in the district, Notun Alo has its own rain and waste water harvesting system. “Every drop of water, barring sewage, is directed to a network of soak pits from where it makes its way to the ground under the house and recharges the water table," says Roy. Another house in Prantik designed by Roy, for Jayeeta Sen, is a unique experiment in earthquake protection. In this house, apart from using Baker’s techniques, Roy has used elements such as an inverted-T foundation and reinforced brick work. “While this kind of foundation makes it subsidence-resistant, the walls, reinforced with a complete skeleton of iron rods, help prevent lateral shifting in case of an earthquake," says Roy. The architect says he infused the latter idea on his own after seeing images of the Bhuj and Kashmir earthquakes, where most of the damage was due to lateral shifting. “I’m not very tech-savvy, but what I like best is (that) the house has been completely personalized," says Jayeeta Sen. She also likes the arrangement of the windows that allows the natural breeze to flow in unhindered. Roy, whose ‘alternative’ creations can be found all the way from Bihar Sharif to Bangalore, admits that such methods of house-building haven’t really picked up. “There is a general perception that such houses, like organic food, are more expensive to build and maintain," he says. However, citing Notun Alo’s example, he says, “If a house its size were to be built in the conventional style, it would cost about Rs18-20 lakh, whereas using these principles brought the cost down to Rs12 lakh, all inclusive." This is achieved by a high degree of localization. For instance, the tiles are commonplace in rural Bengal and are made from poli mati (alluvial deposits). These make them both strong and great insulators. “I think one deterrent is the time taken to construct such a house," says Joyeeta Sen. “As every input is handpicked, it takes longer to finish construction," she adds. Training, or rather retraining, the masons and labourers is another problem. “Most of them have been trained on the assembly line of conventional houses, and have to unlearn most of their ways," says Roy, who recounts having to personally lay bricks to show his masons how it’s done. Lastly, lack of awareness is a limiting factor. It is to overcome these that Roy has started introducing ‘alternative’ elements in commercial real estate. “If more office buildings and malls have these elements, even in a small measure to begin with, we will be able to popularize them," he says, citing the example of Pasa House, a multi-storeyed office property he has built in Ranchi, where he has used the rat-trap bond technique. “Naturally, they were sceptical, so I just sneaked in the wall," chuckles Roy, adding, “Now, the developers (Pasa Group) want more of what they call my ‘new ideas’ in the new buildings they are planning." “Not only are Bijoy Roy’s ideas unique, they have also helped reduce the expenses involved in building walls," says Ajay Agarwal, one of the directors of the Pasa Group, which has interests in steel, engineering and real estate.